Though best known for her work on DC Comics’ Birds of Prey, Batgirl and Wonder Woman, writer Gail Simone has become equally famous for her work in the sword and sorcery genre in recent years. 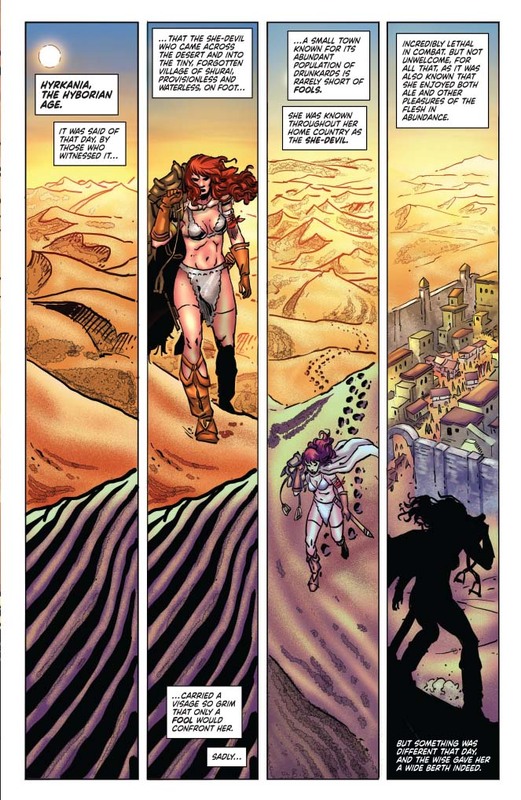 She first found glory with a revamp of Red Sonja that proved popular enough that it was quickly expanded from a 12 issue engagement to 18 issues. She co-authored the first team-up of Red Sonja and Conan The Barbarian in decades and later teamed Cimmeria’s favorite son with Wonder Woman in a six-issue miniseries. She also edited Swords of Sorrow – a major event for Dynamite Comics that saw Red Sonja leading a team of pulp fictions’s greatest heroines. 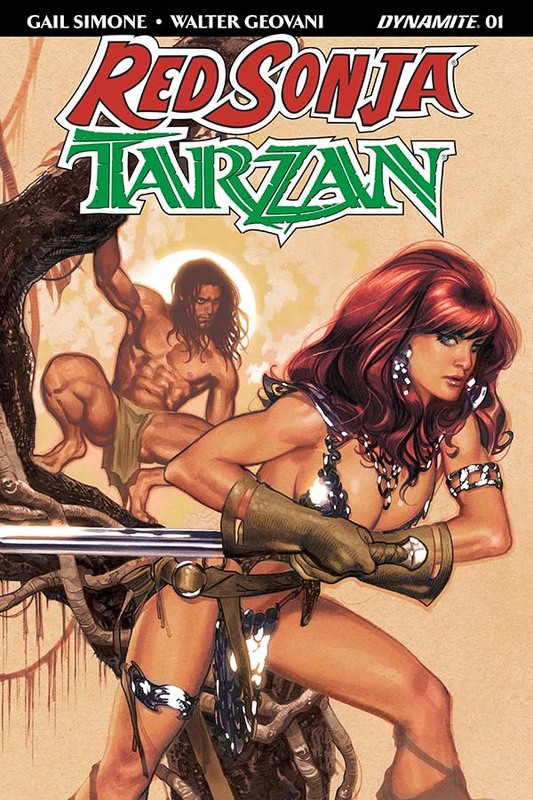 Red Sonja/Tarzan follows after this final story, but the connection is little more than an Easter Egg that should appeal to fans of Swords of Sorrow without confusing those readers who pick this book up on a whim. While the fact that the witch who facilitates the meeting of our two heroes is The Traveler from Swords of Sorrow is a nice nod to continuity, the exact means to the end is ultimately immaterial. This first issue is largely devoted to set-up, with brief introductions of Sonja and Tarzan’s characters and showcases of their awesomeness. In Sonja’s case, this involves her treating her own wounds with strong liquor and a heated dagger. In the case of Tarzan, the involves his showing restraint when dealing with a nobleman whose personal zoo is horrible even by the standards of the 1920’s. 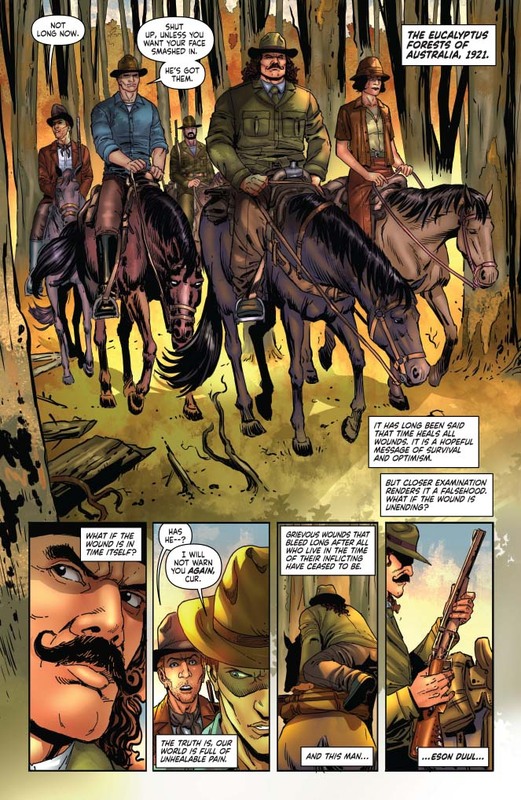 The issue also introduces our villain, Eson Duul – a trophy hunter who somehow exists both within the realms of Hyboria and Interwar Era Britain.